In this case the buyers might hope to see signs of a default before the rest of the market and hope they can trade out of the position. Maybe there'll be no default before maturity, maybe there'll be some interest payments made and a trade out of the position can be made with a profit. The bet is made with someone else's money anyway so the finance professional will make the bet. "Heads I win, tails you lose." At the end of the day Greece was and still is a mismanaged and financially totally overstretched country. Nobody in his right mind should lend against 5%. A riskpremium considerably below equity. However all assets look overpriced so bonds, relatively short ones, look not too bad. As long there is no real inflationrisk (like now with the Euro). As long as the ECB/EZ sort of guarantees at least it looks like you get nominal back, which is uncertain for nearly all other assets. Longer term somebody will however end up with all this crap. Basically one of the reasons people buy is the fact they assume that the stuff is liquid. Largely when the excrements hit the rotating airreplacer hoping for the greater fool. The Euro crisis is a combination of fiancial, economic and political issues which are interconnected on top of that. Imho what markets largely miss is that political risk is very likely to play out over a very long period. Basically it can be summarised as a relevant country either getting austerity fatigue or bail out fatigue in a way that it severely influences national policy making. Read a president LePen, a PM Wilders, a Bunga 3.0 or a Greek ultra-whatever direction. Politics doesnot work according to the economic lines, when it looks to work as markets seem to buy it it is likely to continue working. 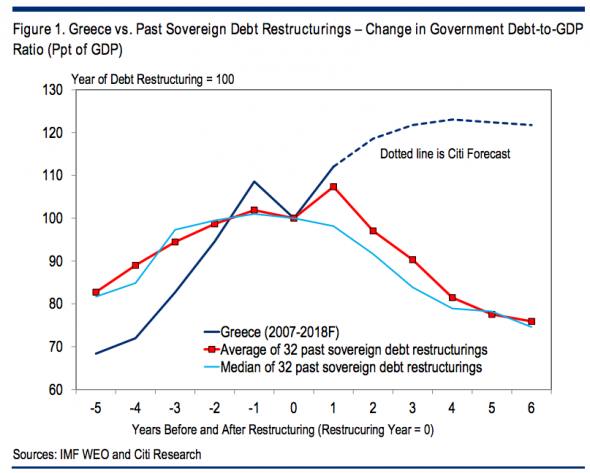 Greece has de facto both austerity fatigue risk as well as bail out risk. Austerity fatigue usually hits in after approx 2 years (probably somewhat later in Europe because of the welfarestates). Bail out hard to tell, but having bought the Ukraine lately will definitely not be very helpful. Another point. Basically all friendly rates for the PIIGS are on the back of Germany and Co. Without Germany the ECB is only a printeing machine. Seen how much de facto is guaranteed by the North EZ it starts to look that they will get overstretched themselves. Especially when real growth seems non existent. This is madness. It is obvious that certain finance "professionals" have learnt nothing since the Credit Crisis and MananaZone melt-down of 2008 and onwards. With more EU-driven austerity on the cards this is casino 'investing' at best. At worst this is wanton recklessness with investor cash. Ongoing QE by the US is distorting asset prices to the point whereby it is impossible to earn a decent return - unless you take a massive amount of risk and invest in Greek sovereign bonds, for example. Not madness, but simply a bet that the EU will continue to be forced to support Greece and other southern economies, for fear that the dream of the United States of Europe will crumble. It will take a few years before they wake up, and the dream vanishes. Someone please explain to me how lending to Greece at 5% p.a. makes any sense?!! Rollo has it right in that investors think these Greek bonds are fully guaranteed by the rest of the EU, by the ECB and by the other governments of the other eurozone countries through the ESM, and especially of course by the government and taxpayers of Germany. They came to assume that was the case before with the bonds issued by the Greek government, even when the EU treaties said otherwise, however I think that any doubt about that has been removed. That plus the fact that there is simply too much money around in markets. -No real alternatives available. All degree of bad. -Lots and lots of excess liquidity. -Financial investors accepting ridiculously low risk premia. -All counting on the liquidity of markets to be able to exit. -Markets going up much faster than realistic extrapolate trends and a likely duration of the crisis and it becomes totally unrealistic. At some point (may be even now) risk will get too big and people will go for cash (or similar like risk free bonds). Lots of sellers and few buyers, some will get badly burnt. Problem is pricing in. All the rubbish that people see or better start to see while be priced in in a few days. Markets are imho getting the risk completely wrong anyway on EZ bonds. They have been focussing on relatively short term political risk (the one determined by politicians) and financial risk. And assume the ECB is similar to the FED. The main danger is imho longer term political risk (the one mainly determined by the electorate). Most likely scenario. North gets fed up. Start to vote massively for populists. Put main stream parties under pressure. On a European level austerity will be dumped upon the PIIGS. Where mismanagement and hidden rubbish will cause uproar. Something Southish leaves (everything better than the Euro). From there the whole thing falls into pieces and eg Greek bonds become totally worthless again. Priced in over a very short period and like before some people will really suffer. The issue is imho social tension in countries. That becomes national political pressure that becomes EU political pressure. As long the South doesnot reallu reform the problems will come back. The issue is they are not competitive. More the fact that they now have ended up in the most overcrowded group (EMs and the whole of Eastern Europe) than cost per item produced. The real world looks at the first thing when to invest, EU politicians at the second (make your bets). ECB is nothing without Germany and Co. And unlike the US Germany can leave or refuse to cooperate. If so the ECB is as good as a guarantor as my goldfish.